-4- thereafter. Covering a wide range of subjects, these algorithms include such standard tasks as the evaluation of special functions, the solution of systems of linear equations, the estimation of definite integrals, sorting of data, etc. All are written in the ALGOL language but can be translated into other languages. An index by subject to these algorithms is included. COSMIC - Under a contract with NASA, the University of Georgia has established the Computer Software Management and Information Center (COSMIC) for the dissemination of computer programs and computer information developed by NASA. One of the primary functions of COSMIC is to identify tehnological advances derived from the space effort and make them available for use by primarily non-aerospace industry. There is a Directory of Computer Programs Available from COSMIC in the UCC Library which contains a KWIC (Keyword in Contex) index and abstracts for these programs, When the program is ordered, there is a program fee of $75 and usually an additional documentation fee. COSMIC Pprograms will not be supported by the UCC. IBM - A catalog of 360 programs provided by IBM is available for reference in the UCC Library. There are also catalogs for other IBM systems which may be used if necessary. Each catalog contains a KWIC index and abstracts of the programs. The actual program material must be ordered from IBM through the UCC LIbrary. Because of the cost of some of the programs, all requests for IBM programs must be reviewed by Phil Dylhoff, Head of Applications Programming. Some of these programs are supported by IBM, but for others IBM serves solely as the distribution agency. 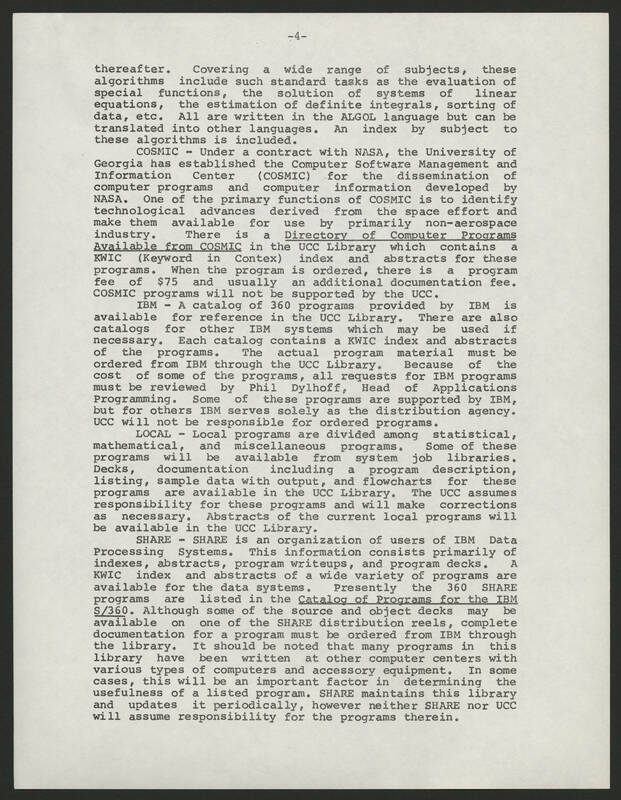 UCC will not be responsible for ordered programs. LOCAL - Local programs are divided among statistical mathematical, and miscellaneous programs. Some of these programs will be available from system job libraries. Decks, documentation including a program description, listing, sample data with output, and flowcharts for these programs are available in the UCC Library. The UCC assumes responsibility for these programs and will make corrections as necessary. Abstracts of the current local programs will be available in the UCC Library. SHARE - SHARE is an organization of users of IBM Data Processing Systems. This information consists primarily of indexes, abstracts, program writeups, and program decks. A KWIC index and abstracts of a wide variety of programs are available for the data systems. Presently the 360 SHARE programs are listed in the Catalog of Programs for the IBM S/360. Although some of the source and object decks may be available on one of the SHARE distribution reels, complete documentation for a program must be ordered from IBM through the library. It should be noted that many programs in this library have been written at other computer centers with various types of computers and accessory equipment. In some cases, this will be an important factor in determing the usefulness of a listed program. SHARE maintains this library and updates it periodically, however neither SHARE nor UCC will assume responsibility for the programs therein.